Archive of our Past Events and such for Posterity… We’ve been busy. + Seattle Skills Center Summer Program Registration is Open! Sign up to take a summer class in a variety of areas from CyberCamp: Digital Animation & Game Design to Aerospace, Culinary to Medical. Program Details online here, and fill out its online registration form here ( Paper form ). Some classes fill up quickly, so act soon. + Annual CGTrader Scholarship 2017*, win up to $3000 for your education, deadline June 1st, details here. + UW Summer Classes in CS & Engineering*among other subjects, prices start around $500+, click on the High School all day or half day programs. Registration is open now. + CodeDay* is coming! Sat & Sun May 20-21st noon to noon. Bring your laptop and build something in 24 hours! For more details click here . For our Garfield HS Discount code, see Mr. Bergquist, and let us know if you are going! + Game Experience America Introduction Event* at UW, Noon Saturday May 20th starting at noon – Smash 4 Tourney to follow. Details and RSVP at https://game.experienceamerica.com/EVENT/ - this is a pitch for their Summer program, cost $2400 with Scholarships available. + Amazon Women in Engineering host TECH OUT! * Event for girls Sat, May 6th at UW, 10-2:30pm. Full Details here, and you can Register Here. + AP CS Review Day & Ice Cream Social*, Sat, 4/29th 1-4pm at UW Paul G. Allen Center for Computer Science & Engineering*. Highly recommended! RSVP here. 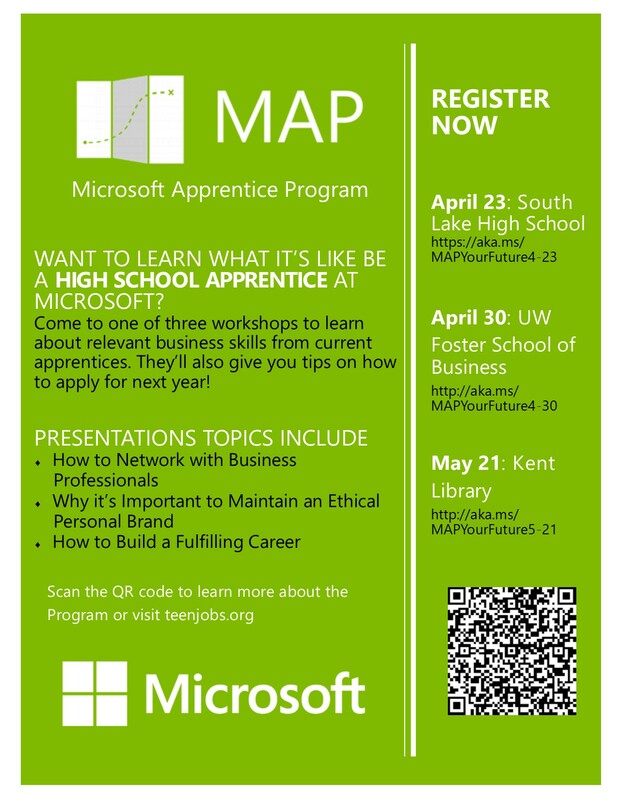 + TEALS is hosting a Mock AP Exam* Sat 4/22 hosted in the Microsoft Commons Mixer (Redmond). Details here + UW Engineering Discovery Days, Fri & Sat 4/21 & 22 at UW! NSBE will put on a Coding Workshop + Programming Contest*, Sat April 1st at Mercer Island, More information can be found under details, limited to 100 students so register here soon! + The Washington State Opportunity Scholarship (WSOS)* supports low- and middle-income students pursuing eligible high-demand majors in science, technology, engineering, math (STEM) or health care. Can earn up to $22,500! Applications due Tuesday, February 28 at 5 pm PST. + UW STARS in Engineering* great local opportunity for students qualifying for Washington State Need Grant. Click here for more details (deadline: Wednesday, March 8th) + Google CS Summer Institute* & Generation Google Scholarship*, deadline for application is Thursday, March 2 + MS Computer Science Internships*, application deadline Friday, March 3rd (11th & 12th graders only). + Girls Who Code Pizza Party Kick Off Monday 3/6 after school in 115b featuring a Senior Google Software Developer Speaker and swag. + Fred Hutch Summer Internships* that have computational opportunities (that’s programming)! Must have completed 11th grade and not graduated (more details later on this). Full details here, applications deadline for all material March 31st – including letters of recomendation, so start early!! Must be available the full weeks July 5th – Aug 25th. + Women FLY conference*, Friday March 24th at Museum of Flight – registration & details posted Feb 1st. + StudySoup Women in Technology Scholarship*, must be 18 to apply, deadline May 15th. + DigiPen* has a Live Broadcast on Facebook, Tue Feb 21st at 4pm exploring the 5 things students should consider to determine if DigiPen is good choice for them. There are additional Information Sessions listed here*. + Women & Diversity Fair*, Sat Feb 4th in Bellevue. + PLU Programming Contest*, Sat. Feb 11th @ PLU + Women of SpaceX Luncheon at Garfield, Tue Jan 17th, lunch & 5th period in the 115a. Permission form & Details. + MS Hackathon*, Sat-Sun 1/14-15 @ Micrsoft National CS Education Week, 12/5-11: + Try out an Hour of Code - Join us Wed after school in 115 for prizes & more!! Here’s our favorite picks! + PSCSTA Programming Contest* is Saturday, December 10th at Microsoft Redmond - registration is closed, but Garfield students will be attending. - John Boyega of Star Wars will be judging at the MS ImagineCup Finals*! Join us for this and the Robo Cup Hackathon* – Fri, July 29th (click here for details): Make sure you can attend Friday July, 29th. Turn completed form into the Garfield HS Front Office (7-2:30 M-F) as soon as possible, space is limited. - Our new Girls Who Code Club meets Tuesdays after school in 115B! Learn to make Apps & websites with two local professionals! Join us in being creative! - NEW! WeHack* 2-Day Hack-a-thon for female students on May 14th & 15th. Check it out. - Everyone: CodeDay! *, a 24 hour Hack-a-thon is May 21 & 22nd, check it out and sign up now! (See Mr. Bergquist for discount codes or if you need admission) - Youth Apps Challenge* App design Submissions are due Wednesday, April 27th, talk to Mr. Bergquist! -TEALS is hosting a Mock AP Exam on Saturday April 16th and 23rd in Redmond and Wallingford, respectively be aware, the Programming Contest is the 23rd too, so you may want to target the 16th. More details here. - Girls Going to UW Next year: WiSE UP Summer Bridge Program* (flyer) for first-year female students who will start at the UW this fall and are planning to major in engineering or computer science. Spend 4 1/2 weeks learning strategies for university-level study and engaging with the UW academic community and peers. Deadline to apply is Sunday, May 8th, cost $300. - August 1-5th Summer Camp at Microsoft, see details. Register here! - Seniors Only: Microsoft Young Technologist Seminar Intership* Earn $4,800 learning to design and build tools at Microsoft for 6 weeks. Application Due Wed, March 23rd (short form and Resume). - Tech Out! * for girls at UW, Sat 26th March – Full Details. Register Here limited space (Poster to share!) - Girls Who Code Summer Immersion Program* – 7 week program registration is open. Check it out! - deadline to apply is now Tuesday, March 8th. - Microsoft Internships* & Google Computer Science Summer Institute (CSSI)*, summer 2016 - check the application deadlines (first week of March). - Code Now* – March 5, 6th, & 19th. Free coding workshop for High School students. Registration due by Wed, Feb 24th! - CodeDay* Sat-Sun Feb 13-14 Noon to Noon. Details here. See Mr. Bergquist for other Garfield Students attending. 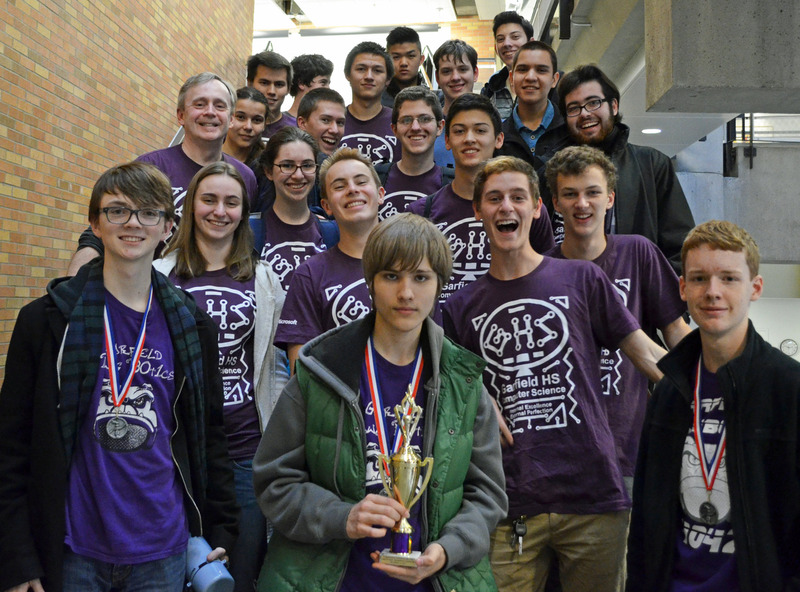 - Fall 2015, Dawgbots ranks 2nd in Robotics Competition! - Apple Engineering Technology Camp* - 4 Week Summer program for current Sophomores & Juniors. Details & Registration here*. Deadline: Friday, February 5! - Chick Tech Event UPDATE Dates Jan 30 & 31st, still recruiting! * - details of registration on page, due Friday 1/15, checking with your folks first. - NCWIT Aspirations in Technology competition* - all female students interested in technology should consider applying. Deadline (extended) Wednesday, Nov. 4th. - CodeGirl Movie Screenings - Free at Google & Amazon.com* Wednesdays, Nov. 4th & 11th, respectively. Sponsored by Women@Google & Amazon Women in Engineering. - EasyCTF a High School Hacking Competition*, happening now, create a team to learn how systems work and can be hacked through a series of puzzle challenges. - Android Studio, the new free professional development environment using Java. To learn more check out Marty Stepp’s CS 193A: Android App Development Class resourcesfrom this past Winter at Stanford. Computer science is all about transforming our reality by solving hard problems. Far from just “using computers,” it is a dynamic, academic field that has roots in engineering, mathematics, business, philosophy, psychology, linguistics, and the arts. What Most Schools Don’t Teach - we have here at Garfield! Paul Allen Computing Challenge - a great opportunity to learn to use data. Hack the CD! Startup Weekend Event was 9/26-28 at Garfield HS – check out the details and winning projects. Details about our Garfield Apps Club!! Our Garfield 2014 App Challenge Winners!! 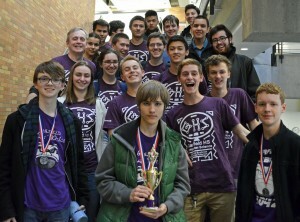 Garfield 1st Place in Spring Programming Contest! Free Career Summer Classes Available: Aerospace, Culinary Arts, Cyber Camp, Medical Careers and more! The Spring 2014 Paul Allen Computing Challenge Contest Details here. Garfield takes 2nd Place Advanced in Fall Programming Contest!! Garfield Dawgbotics Takes 3rd placein the Seattle Qualifiying Competition!! Computer Science Week 2013 Details Here!! Women in Technology Luncheon Details! Our Garfield Computer & Technology Clubs (pdf) - New 3D Printer Project! 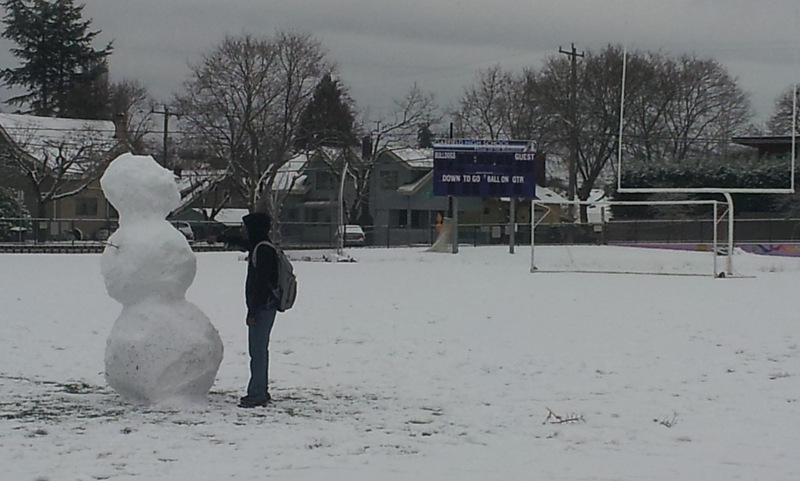 Snowman! AfG Trial Notes SPS Computer Programming 110201 2015 - Teacher Only Reference.